This example shows you how to use J-Integra® to invoke existing VBA (Visual Basic for Application) objects in a Microsoft Excel workbook with pure Java. You will use J-Integra® to interact with the objects, properties and methods exposed by Microsoft Excel either locally or remotely. VBA (Visual Basic For Applications) is a macro language that is identical to the Visual Basic programming language. 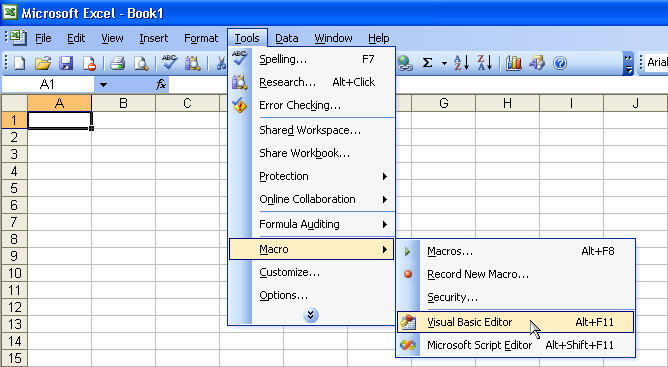 By using VBA you can easily handle objects and collections exposed by Microsoft Office. Since VBA can be embedded inside Excel workbook, you can use J-Integra® to trigger a VBA macro by emulating the end user’s interaction. You can run the Java client on a Windows machine to access its local Microsoft Excel, or run the Java client on a non-Windows machine (such as Linux) to access Microsoft Excel installed on a remote Windows machine. Ensure that you have you have installed the J-Integra® license. This document is based on Microsoft Excel 2000 API. If you are using Microsoft Excel 97 or Excel XP, please note that Excel Programming APIs are different among Excel 97, 2000 & XP, and therefore you need to use different method calls of generated Java proxies. Create an empty Excel workbook in C:\Java-VBA\ and name it JInvokeVBA.xls. MsgBox "Sub test() in Module1 is invoked"
Now your VBA code should be like this. Compile the VBA code and save the file. Run J-Integra®'s com2java tool on the Windows machine, and select C:\Program Files\Microsoft Office\OFFICE11\EXCEL.EXE as the type library, choose an empty directory named excel (e.g. C:\excel) as output directly, and use excel as Java package name. Click the Generate Proxies button to generate Java proxies from Excel type library. 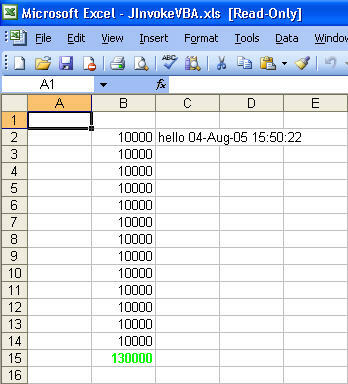 This example is for Microsoft Office Excel 2003. If you use a different version of Excel, you need to look at the generated Java proxies (Workbooks.java) and call the methods accordingly. // JInvokeVBA.java remotely accesses Excel. // Invoke the method "method1"
The -J parameters make more memory available to the compiler than it would normally have, since there are a lot of generated files in this example. JInvokeVBA will open JInvokeVBA.xls, activate Sheet2, and run the VBA macro. Move the com2java tool to the Windows machine to generate the Java proxies from Excel, and then move the Java proxies from the Windows machine to the Linux machine. Install J-Integra® (the jintegra.jar file) on the Linux machine and include the jintegra.jar file and generated Java proxies in CLASSPATH. Use DCOMCNFG to configure Excel on the Windows machine. Refer to Configuring DCOM for Remote Access for more information about AuthInfo.setDefault. To access OLE Programmatic Identifier (ProgID) from Java, you'll need to generated Java proxies from C:\WINDOWS\system32\FM20.DLL using com2java and put them in a Java package named "FM20". For example, open JInvokeVBA.xls, click View -> Toolbars -> Control Toolbox, and draw a Command Button named "CommandButton1" on the Sheet1. To control this Command Button from Java, you'll need to use this code snippet below. J-Integra® is a generic bi-directional bridge between any Java objects and any COM components. We do not provide the documentation of the generated Java proxies since the Java proxies are just mapped from the programming API of the COM component. For more information about Microsoft Excel programming, please refer to the Microsoft Excel VBA Language Reference. It's also easier to find a VB example first, and then convert the VB example to Java program using the reference Mapping VB Code to Java Code.